Sunset Eat Fresh, Day 1: Sayonara, Soda! 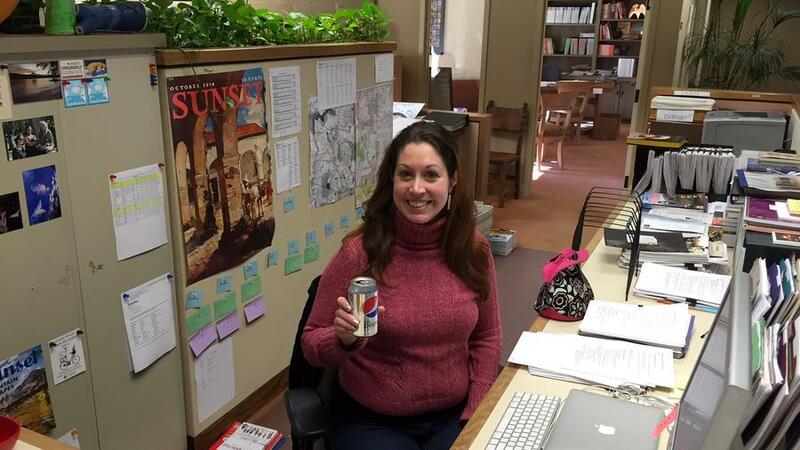 The author enjoys her last Pepsi (well, at least for two weeks). I’m giving up: Soda, a.k.a. pop, Pepsi, Coke, Dr. Pepper, 7-Up. I’ll miss thee, sweet mistress, my saccharine midday pick-me-up. I chose this because: As Marilyn Monroe is to the white dress, as Bart Simpson is to the skateboard, as The Dude is to the White Russian, so am I to the Pepsi. No matter the day, the week, or even (it’s true) the year, this sweet carbonated beverage is my constant companion. In fact, my love of pop is so well-known that I received a congratulatory phone call the day that the soda tax failed in San Francisco. That said, I know that soda is not healthy for my teeth, my waistline, or my wallet, so this month I’m trying to kick (or, at least, cut down on) my consumption. My biggest obstacle: The hours between 11:30 a.m. and 2:30 p.m. (Really!) My daily Pepsi gives me the sorely-needed midday boost after that morning latte has worn off. How else will I keep my energy levels up without that noontime jolt of sugar and caffeine? My biggest temptation to cheat: Might be nights and weekends. Then, I won’t have my virtuous co-workers around to keep me on the straight and narrow—and I do love my Moscow mules. Coping mechanisms: I plan to drink a lot of water (out of a water bottle with Little Miss Sunshine emblazoned on the side, ironically). I’ve also dug into Sunset‘s archives to find some tasty juice, smoothie, and flavored water recipes to try to fill the void that soda will leave behind. And, last but not least, I’ll feel no shame if I need to grab a midday latte for the caffeine hit. I’m feelin’: Great, so far! After all, it’s not even noon yet. A recipe I’m really digging: I started my day with this pineapple-banana smoothie, from our January 2013 issue. It tastes almost as good as 41 grams of pure cane sugar! Follow us! Twitter @sunsetmag, Instagram @sunsetmag. Show us your #SunsetEatFresh challenges, too, on Facebook, Twitter, and Instagram.